Has Ash Williams vanquished the Evil Dead? Is the Ash Vs Evil Dead TV show cancelled or renewed for a fourth season on Starz? The television vulture is watching all the latest cancellation and renewal news, so this page is the place to track the status of Ash Vs Evil Dead, season four. Bookmark it, or subscribe for the latest updates. Remember, the television vulture is watching your shows. Are you? The third season of Ash Vs Evil Dead averaged a 0.08 rating in the 18-49 demographic and 172,000 viewers. Compared to season two, that’s down by 53% and 44%, respectively. Learn how Ash Vs Evil Dead stacks up against other Starz TV shows. On April 20, 2018, Ash Vs Evil Dead was cancelled. Could it return for a fourth season, someday? Stay tuned for further updates. Will Starz cancel or renew Ash Vs Evil Dead for season four? The ratings have really tanked this season. Starz doesn’t depend on commercial viewing but they do still need to produce programming that will help them keep subscribers. I suspect the show will still be renewed but it could easily be cancelled. I’ll keep an eye on the Nielsens and update this page with breaking developments. Subscribe for free Ash Vs Evil Dead cancellation or renewal updates. 4/20/2018 update: Starz has cancelled the Ash Vs Evil Dead TV show. You can find the details here. Pardon my abrupt exit, but I’ve got the munchies and must ready myself for dinner. Check the rankings for other Starz scripted TV shows. Find more Ash Vs Evil Dead TV series news or other Starz TV show news. What do you think? Did you think the Ash Vs Evil Dead TV show would be cancelled or renewed for season four? Is it ending at the right time? Sound off, in the comments. 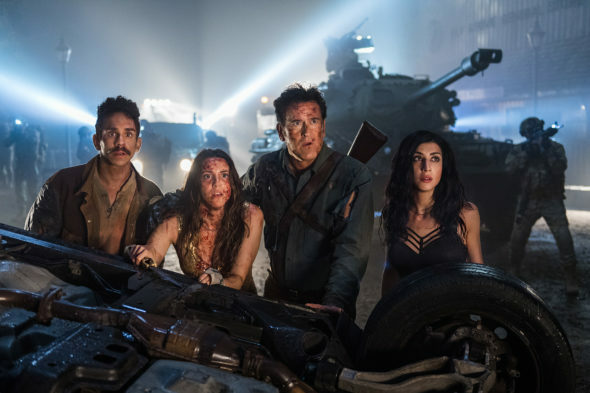 More about: Ash Vs Evil Dead, Ash Vs Evil Dead: canceled or renewed?, Ash Vs Evil Dead: ratings, Starz TV shows: canceled or renewed? Sad, really! This goes away, but garbage like Big Bang Theory keeps on going! What nonsense! Bruce Campbell fans should unite on this one. The show is cult status like he movies. Hopefully it is not a permanent cancellation for this of us who wait for 9 p.m. on Sunday. I think the biggest problem is, it had the same time slot , different network, as “The Walking Dead”. With such a big turnaround in that show maybe Ash would have his shot at new fans in Geekdom! May have to have: Ash Vs Evil Corporate Suits…for the series to continue. Been great to see Bruce & Lucy back together. Thanks for everything! #Bringbackboomstick. This show is the most epic fun fast paced best made shows on air at the moment. Watching it on Netflix Netherlands every week. Please renew.